This is how a box full of printed circuit boards looks like. 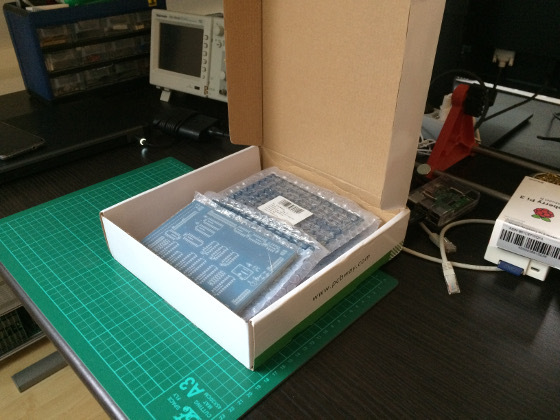 That’s 30 boards total – memory card and 5 CPU cards, each in 5 copies nicely sealed in plastic. They have been sitting in my drawer since last Summer. In the meantime I have undergone a little surgery, moved to a new house, went to India on a business trip, went on holidays, and almost crashed my Subaru on the Nürburgring. Quite a lot for half a year. Other than ordering boards, there has been no real progress on BYTEC, though. Now with things a bit settled, I decided to it is time to do some homebrew CPU work again. That said, the soldering station is out of the box, assembled and ready for sessions. Judging by my pace when I was soldering Rev. 1.0 boards last time, I think I should be ready to attempt power-up sometime in January. All that provided I don’t lose the motivation somewhere on the way. After 7,5 years of (very) slow development, that should give me something achievable to work on, yet complete enough to think of BYTEC as of a successful project should I never pick it up in the future. I just want to share with you my project of a homemade CPU, based on a FPGA. This project is now on the homebuilt-CPU webring. Do not hesitate to give me feedback about my project (on hackaday or via e-mail). On my side, I have been reading your blog about Bytec16 for a long time, and I am happy to see that the project still goes on after many years. I continue to be impressed with your work! On the software side, have you seen FUZIX https://github.com/EtchedPixels/FUZIX ? It’s a UNIX-like clone for small, small machines (Z-80/6809/6502) and is meant to be highly portable — the core code compiles for the Z-80, 6809, 6502, 8086, 68000, PDP-11 and I’m probably forgetting something. The plus side vs. Minix 2 is that it’s smaller and in ANSI C and under active development. The downside is it’s smaller, and a lot of things are missing – there’s no networking (though a couple people are working on it). Getting it to build is also a pain, but cross-compiling Minix would be hard to set up too. It’s adaptable to your memory model, I think. @Retrac, I have never heard of this, but I will definitely have a look. Thanks for the hint!